First the good news. 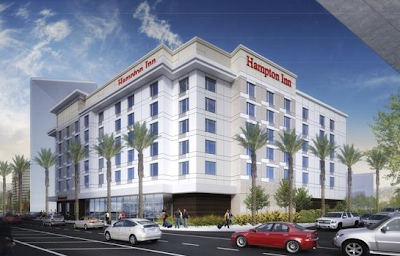 Hampton Inn (part of the Hilton family) has announced plans to build a 162-room hotel at the southeast corner of Santa Clara Street and Highway 87. The building will be about 100,000 SQFT, including 6,000 SQFT of new ground-floor retail. Now the bad news... it is only six stories tall and looks like a convalescent home. You can see for yourself below. 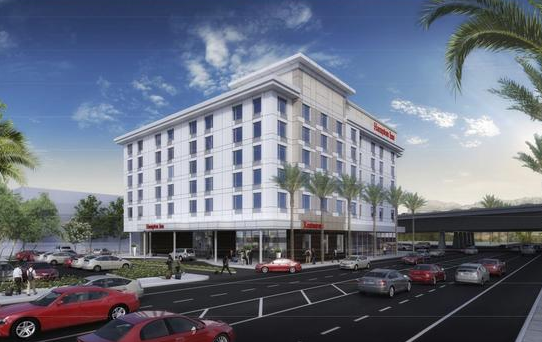 When I first saw the renders I immediately thought of a similar hotel in McCarthy Ranch surrounded by parking lots and big box stores. Fortunately, this design has sparked instant outrage from the City and those that live in and care about Downtown. I would be really surprised if they don't make some serious revisions before this breaks ground (much like the One South Market further down Santa Clara Street). I think that if this design was proposed five years ago, nobody would have thought twice about it. Now that we have built up some pride for our Downtown, people are no longer accepting half-assed generic designs. It's time to take things to the next level!